It has been a very long while since my sewing machine was used. Sewing. Small project, simple stuff, shortening curtains and making a valence/ruffle. 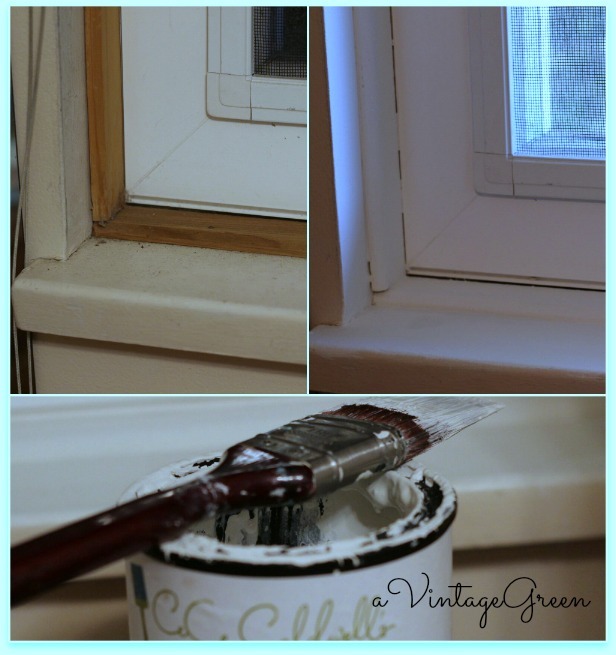 That lead to painting the inside of the window frame and the ends of the double curtain rods with chalk-clay paint in Simply White and waxing the paint, a lovely window area upgrade, soothing. The sequence started when we revamped a small clothes closet back to its original purpose of a shelved closet (DH cut some shelves and I put them on the original supports). My sewing machine and serger now have a 'home base'. Incentive. Convenience for lifting out and on to the kitchen table (which meant the laptop had to be moved and a portion of the table cleared but that was a 'good thing'). The curtains were a thrifted find last summer as were the double curtain rods. 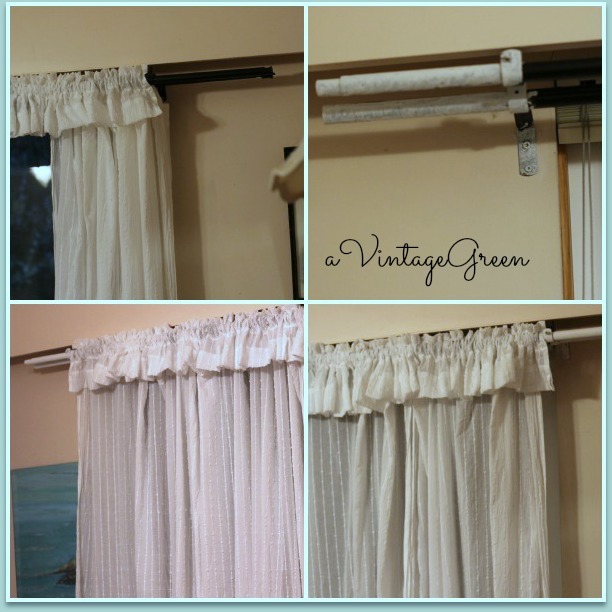 At that time I put the brown double rods up (using my little Makita drill) and because the curtains were too long I tied the bottoms into a loose knot. That was ok last year. I liked the semi sheer elegance of the curtains but, really, not too convenient for closing. An eventful year passes. Energy this week. Why not just shorten the curtains. Got out the ironing board to use as a cutting surface, dug out my 'best scissors' (which for some reason aren't as sharp as they used to be). 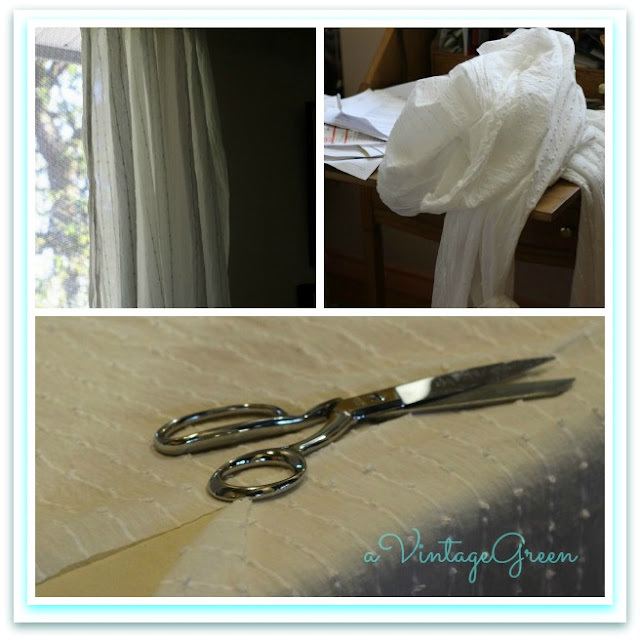 Dotted white on white curtains made it easy to cut straight lines. Hemmed, hung, nice. 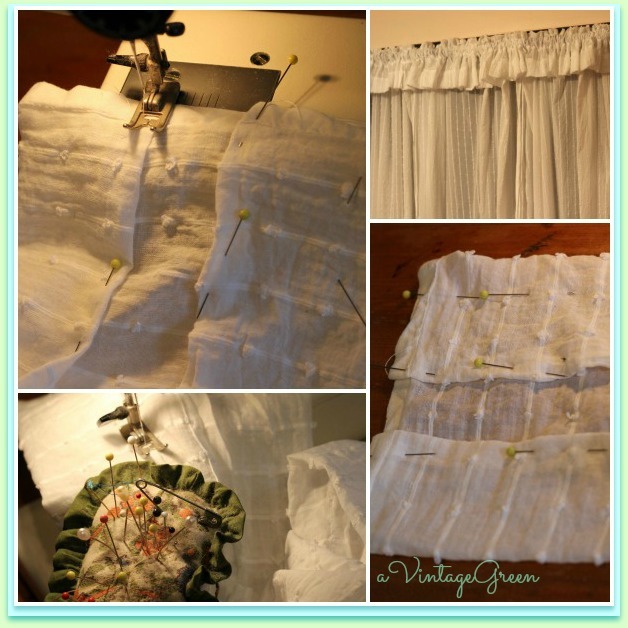 Left over pieces were decent width strips of curtain, wide enough maybe to make a valence/ruffle on the front of the double curtain rods. Pinned, checked to made sure the 'pocket' was deep enough. Sewed the first section, slid it on the front rod, looked fine, sewed the second and noticed that the line I was following had 'shifted 1 inch', removed the seam and was more careful sewing the last three ruffle sections. My pincushion is circa age 16 when my Mom made bedspreads and curtains for my room. She used the scraps to make me a pincushion. Sweet memory. Not perfect but very pretty, happy with the result. Put the curtains and valence up, took pictures. Interesting how much detail shows up in pictures that the eye ignores when looking around. Also interesting how yellow everything looks when the real curtain color is a soft white. Night lighting, indoor lighting, small room make some of the reasons. So, white on white curtains but the rod is dark brown and the window trim is natural mixed with off white. This is where the chalk-clay paint in Simply White comes in (at 8:30 in the evening), carried on the next day with 2nd coat. Waxed frame. Added some flowers and called this one a job well done. Flowers were gifted from my friend's M's garden, with thanks. 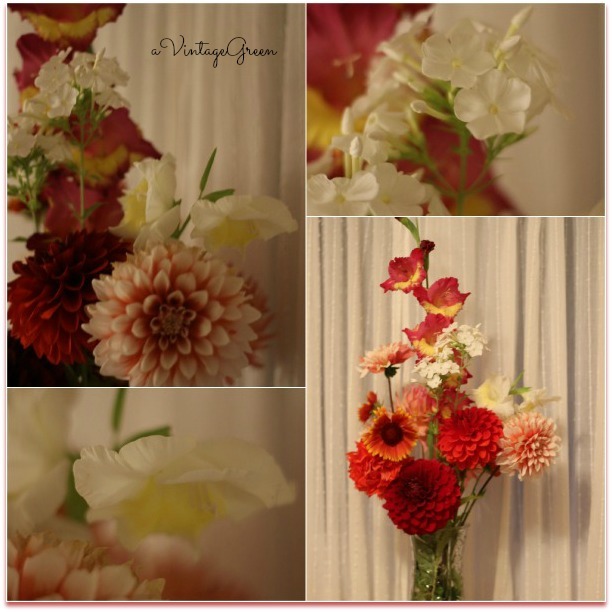 Evening views of flowers below with the background of the white curtains. No additional cost for this project, used what I had on hand. Early afternoon view of the flowers against the white curtains. Contented. Nice project the flowers look beautiful. Glad your energy is returning. Your sewing job looks great Joy! Glad you have some extra energy! It's always fun to see what you are up to. Prayers and blessings to you! I think those curtains are so pretty! Hi, I'm coming over from Debbie Doos Pinterest Party. I pinned your small curtain project under For the Home. Following you. Linda Oh, and I'd love to have you come over to my party also. visiting from Sew Many Ways. 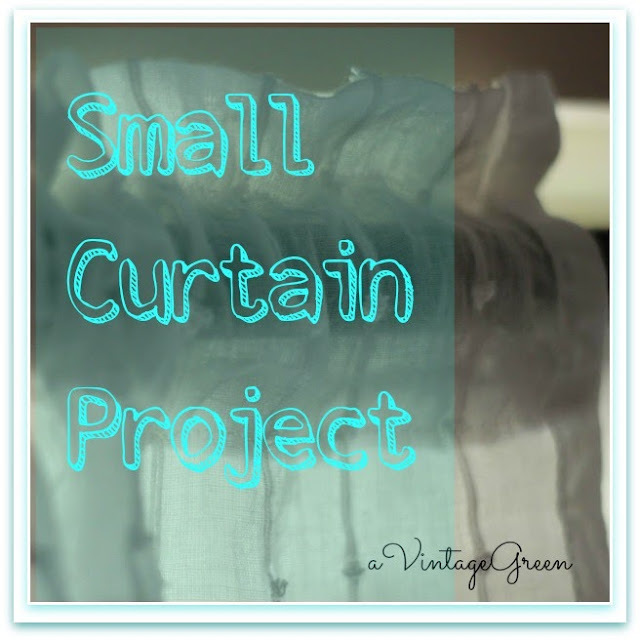 I love the thrifted curtains, what lovely material to find. Great sewing job and the whole window with paint now looks amazing. Joy, your thrifted curtains are lovely. And the flowers are a colorful addition. You did a wonderful job, thanks for sharing. Have a happy week ahead! On a side note, I need to pick up a pair of those scissors. My grandmother had one in her button/junk drawer. I thought they were wickedly dangerous. Added to my mental want list. Great work on the cushions Joy! Love the ruffle over the top of the rod! hi Joy ... the curtains look wonderful. Great job and oh my, how I love your fresh flowers. Glad you are feeling better. Found you at Kathie with an E.
Hello! Your curtains look great! I think it's so neat that you still have the pin cushion from when you were 16! I am not much of a seamstress but I made some seat cushions last week and discovered that I quite like sewing. So now I'm on the look out for more things to sew! I am a new follower and I look forward to getting to know you better! Please visit me if you get a moment! It's always fun to make a big change that doesn't cost anything and looks great. Those flowers are lovely! The curtains look nice. Isn't it funny how one little project turns into five? I'm glad to see I'm not the only one with that problem! 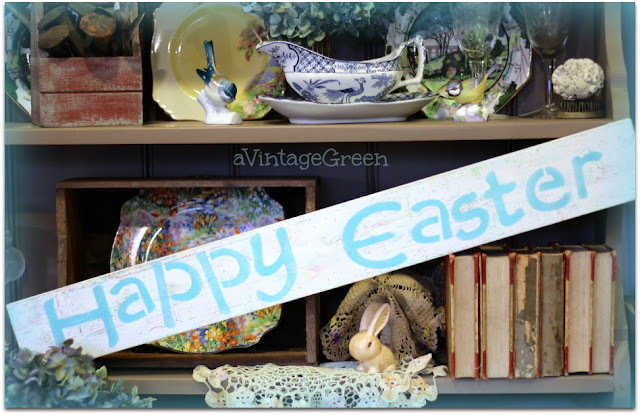 Thanks so much for linking up to Frugal Crafty Home Blog Hop! I hope to see you back next Sunday night! I love the curtains. They look wonderful and they make a great back drop for your pictures. Thank you for sharing this with the Less Laundry, More Linking party. 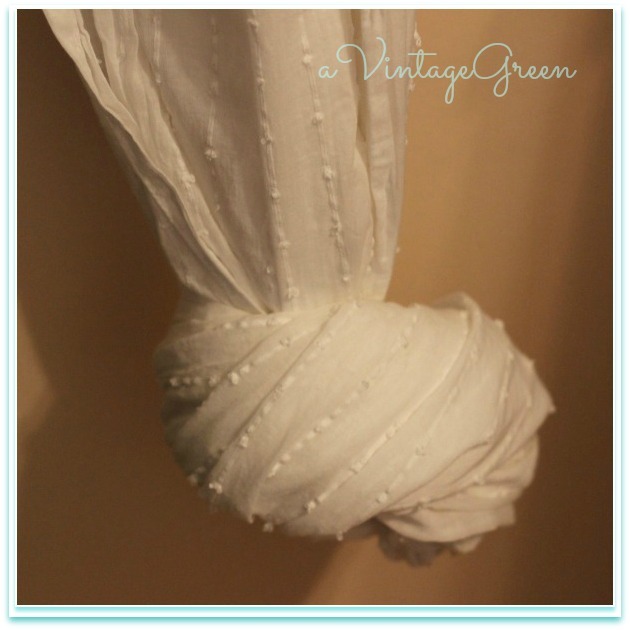 I love white on white curtains! Add in polka dots and I'm sold. I understand you're interested in photography Joy, and you mentioned you weren't happy with the light in some of your pics. A few weeks ago I purchased a flash and it was the best $50 I ever spent. Big hly recommend it! Thank you for linking up at our blog hop! We are so happy to have you. You did a very lovely job with those curtains! It looks so pretty. thank you for sharing at TTF! Great job Joy. 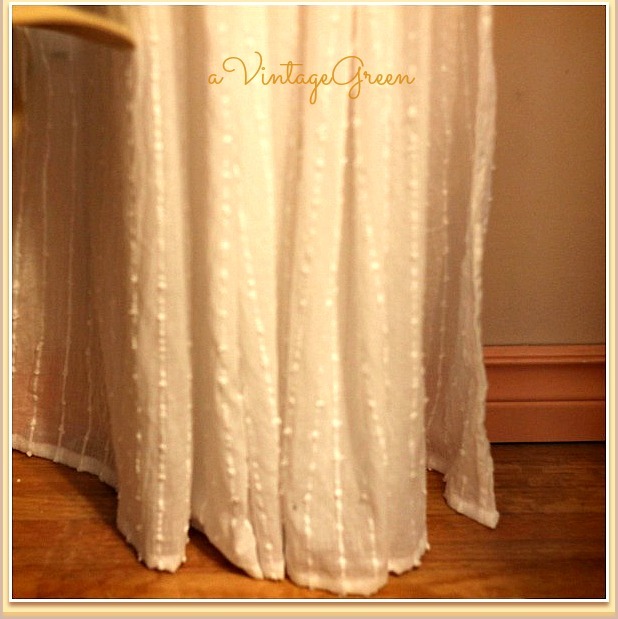 I have curtains like this fabric in my living room and I love them! I too painted a brown rod white with chalk paint. 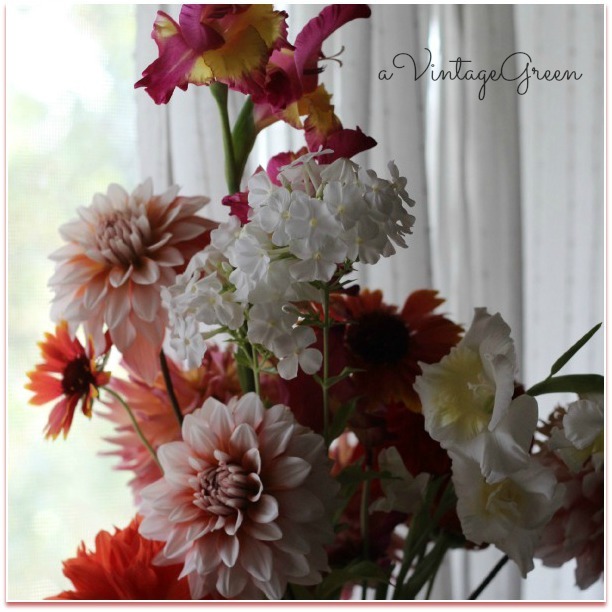 They are a beautiful back drop for your gorgeous flowers. Thanks for sharing with SYC. I love the added ruffle Joy! I used those same curtains in my daughter's room! And the flowers are beautiful!